In the highly acclaimed bestselling A Call to Action, President Jimmy Carter addresses the world’s most serious, pervasive, and ignored violation of basic human rights: the ongoing discrimination and violence against women and girls.President Carter was encouraged to write this book by a wide coalition of leaders of all faiths. His urgent report covers a system of discrimination that extends to every nation. Women are deprived of equal opportunity in wealthier nations and “owned” by men in others, forced to suffer servitude, child marriage, and genital cutting. The most vulnerable and their children are trapped in war and violence. A Call to Action addresses the suffering inflicted upon women by a false interpretation of carefully selected religious texts and a growing tolerance of violence and warfare. 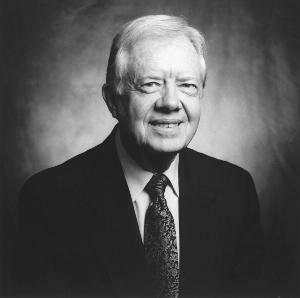 James Earl "Jimmy" Carter, Jr. was the thirty-ninth President of the United States, serving from 1977 to 1981, and the recipient of the 2002 Nobel Peace Prize. Prior to becoming president, Carter served two terms in the Georgia Senate and as the 76th Governor of Georgia, from 1971 to 1975. As president, Carter created two new cabinet-level departments: the Department of Energy and the Department of Education. He established a national energy policy that included conservation, price decontrol, and new technology. Foreign oil imports were reduced by 50% from 1977 to 1982. In foreign affairs, Carter pursued the Camp David Accords, the Panama Canal Treaties and the second round of Strategic Arms Limitation Talks (SALT) . Carter sought to put a stronger emphasis on human rights; he negotiated a peace treaty between Israel and Egypt in 1979. His return of the Panama Canal Zone to Panama was seen as a major concession of U.S. influence in Latin America, and Carter came under heavy criticism for it. The final year of his presidential tenure was marked by several major crises, including the 1979 takeover of the American embassy in Iran and holding of hostages by Iranian students, a failed rescue attempt of the hostages, serious fuel shortages, and the Soviet invasion of Afghanistan. By 1980, Carter's disapproval ratings were significantly higher than his approval, and he was challenged by Ted Kennedy for the Democratic Party nomination in the 1980 election. Carter defeated Kennedy for the nomination, but lost the election to Republican Ronald Reagan. After leaving office, Carter and his wife Rosalynn founded The Carter Center, a nongovernmental, not-for-profit organization that works to advance human rights. He has traveled extensively to conduct peace negotiations, observe elections, and advance disease prevention and eradication in developing nations. He is also a key figure in the Habitat for Humanity project. Carter remains an particularly vocal on the Israeli-Palestinian conflict. As of 2008, Carter is the second-oldest living former president, three months and 19 days younger than George H. W. Bush.